The National Geographic Channel has slowly but surely been making a presence for themselves in the field of TV movies, thanks – oddly enough – to having been provided with the opportunity to adapt a couple of Bill O’Reilly’s books. First came “Killing Lincoln,” starring Billy Campbell as ol’ Honest Abe, and, to keep things on a chronologically-accurate path, next up is “Killing Kennedy,” with Rob Lowe taking on the role of JFK. NatGeo is going out of their way to make sure TV critics are well aware of this project, first of all by spotlighting it at the summer TCA tour and setting up interviews with various cast members, then by sending a few additional critics – including yours truly – to a press junket in Dallas, where we were fully immersed in the details of Kennedy’s final 48 hours. I mean, seriously, it was pretty amazing: we stayed in the same hotel where JFK and Jackie Kennedy spent their final night, met a few folks who were actually there that day, stood in the places where he gave some of his final speeches, and then went on a tour of various locations in the Dallas / Fort Worth area which were key to both JFK and Lee Harvey Oswald over the course of those last hours, including attending a screening of “Killing Kennedy” in the Texas Theater, where Oswald was apprehended, and then we had dinner on the seven floor of the former Texas School Book Depository, after which we went downstairs one floor to a museum dedicated to the assassination…as is only appropriate, since that’s where Oswald was stationed. 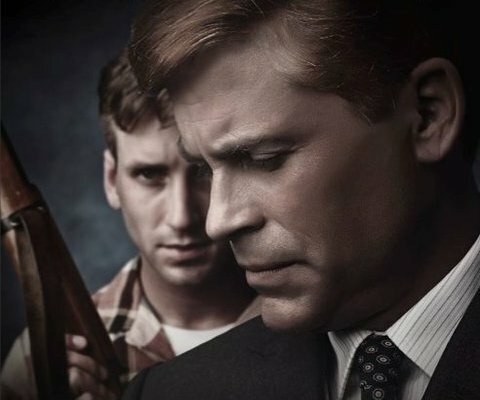 Having watched “Killing Kennedy,” I will say that, first and foremost, the reason to see the film is not necessarily Lowe and Ginnifer Goodwin as JFK and Jackie – although they both do quite well, with Goodwin in particular shining in the post-assassination scenes – but, rather, Will Rothhaar and Michelle Trachtenberg as Oswald and his wife, Marina. Rothhaar, who was with us throughout the tour of Dallas, is liable to get a serious career boost after the work he does in the film, and Trachtenberg will surprise many with her fluency in Russian…much as she surprised the producers of the film, who didn’t know she could speak the language until after they saw her audition. If you’ve got Kennedy fever, though, I recommend that you tune in early to watch “JFK: The Final Hours,” a documentary which, while perhaps a bit overlong, provides an amazing amount of detail about what Jack and Jackie did during their time in San Antonio, Fort Worth, and Dallas in the day or so before that fateful trip into Dealey Plaza. Plus, it’s narrated by Bill Paxton, who – you may or may not know – was actually in attendance for JFK’s speech outside the Hotel Texas in Fort Worth the morning he was assassinated. Okay, enough of my yakking…not that it probably bothered those of you who were drawn here by the title of this piece, since I’m sure all you did was skip past all the opening paragraphs and go straight for the Rob Lowe interview, anyway. All things being equal, what I’d hoped to do was spend enough time with Rob Lowe to produce a Random Roles interview for the Onion AV Club, but we only had about 10 minutes together during the TCA tour, and we never managed to hop back on the phone in the intervening time, so that just never happened. As such, Bullz-Eye reaps the benefits of the “Killing Kennedy”material, while I continue to hoard the stuff he had to say about “Class,” “A New Kind of Family,” and “The Stand” until I am able to get on the phone with him. For now, though, I hope you enjoy his comments on playing the President of the United States.